Regarded as a leading business names, we are thoroughly betrothed in delivering a wide array of CNC Milling Service. Highly treasured in the industry owing to it seamless finish, this provided Services is hugely commended. Together with this, we also present customization facility for this plethora to our patrons. We use Multi-axis CNC machining centers, EDM, Wirecutting and associated processes to produce tools of close tolerances with any surface finish you require. - Fast Turnaround: We operate on a rotational roster 6 days per week. 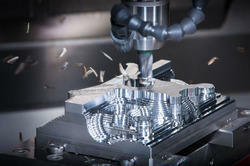 - Cost Effective Solutions: We have innovative machining procedures ensuring efficiency and value for money. We are specialist in any type of machining required in graphite sach as CNC Milling , CNC Wire Cut etc.We are also able to designing press tools.We design all the Moulds at our end with the latest CAD CAM Software for Designing & Moudeling & Machining.